The Most Awaited Luxury Wedding Exhibition of 2018 Is Here - The Wedding Junction Show! Are you a bride-to-be who wants to know all the new trends & updates for this 2018 wedding season, then you’ve got to attend the Wedding Junction Show! It is the one stop for all you brides looking for fashion designers, caterers, jewellery designers, hotels, planners and much more! It is a show so grand that it will remain etched in your memory forever! The Wedding Junction Show promises exhilberancy, exhilaration and delectation. We are proud to announce that we, Weddingz.in are their official wedding partner, so you also have a chance to meet our team at the venue & get your wedding planning started & sorted :) ! The brilliant designer behind AND, Anita Dongre is all set to launch her Summer/Spring 2018 collection at the Wedding Junction! 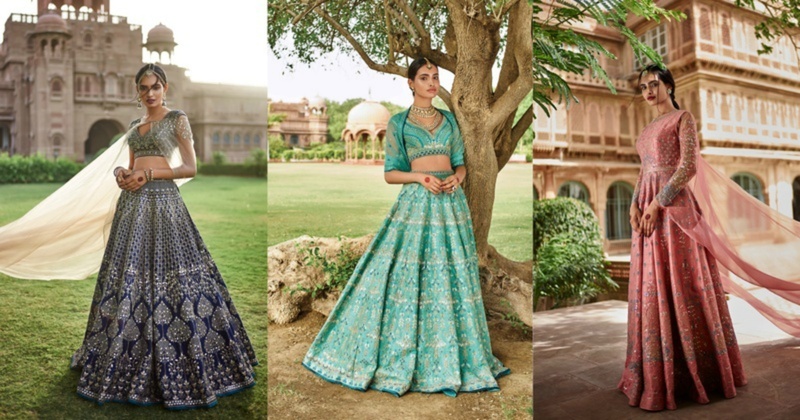 So get all set to dive into the most trending flawless styles which are beautifully enticing and full of traditional splendour with Anita Dongre! Guess who is the showstopper for the Anita Dongre Fashion Show? Shraddha Kapoor! Yes, you read that right! Shraddha Kapoor is the brand ambassador for the Wedding Junction Show!! And you also stand a chance to meet her along with your 2 BFFs - participate here. From world-renowned landmarks to modern business hotels, idyllic beach resorts to authentic grand palaces, each Taj Hotels offer an unrivalled fusion of warm Indian hospitality, world-class service and modern luxury. For over a century, The Taj Mahal Palace, Mumbai, the iconic flagship has set a benchmark for fine living with exquisite refinement, inventiveness and warmth. From small-and-intimate to larger than life-and- lavish, our team at Dreamzkraft have the resources and knowledge to convert your dream wedding into reality in any part of the world. We have been into wedding décor and styling for over 12 years and are on the panel of all major 5 star properties in Mumbai including, but not restricted to, the Taj properties, Hyatt group of hotels, Marriott group of hotels, Sahara Star etc. Genesis Jewels are designers and crafters of functional yet fine jewellery pieces for every need! India’s leading fashion designer, Divya Reddy believes in creating her own style statements and balances creativity, art and science in all her designer collection. Divya Reddy and Genesis Jewels are all set to come together at the Wedding Junction Show! To observe the rules of nature's most divine gift- the purity of elements, CH Jewellers has marked the ultimate benchmark in the purity of gold, diamond, silver, white gold and platinum, a true understanding of purity has assured millions of clients worldwide, and for that CH's three generations stand with dedication. CH believes in morals of services and satisfaction of patrons with complete devotion, for CH purity means the inner soul. Glamourise your big day with opulent and sumptuous couture intricately designed and blended for you by Jade! Watchout for Jade and CH Jewellers at the Wedding Junction Show! Sparkling with Indian Inspiration, The Maalka Fine Jewellery collections are a statement of timeless elegance and sublime craftsmanship. Their multifaceted collections are sure to leave your eyes wide open! Pallavi Jaipur is an amalgamation of traditional forms and modern sensibilities into a contemporary wear is her brand's philosophy, emphasizing global style. Ensure you’re over elegant and not over-dressed with Nivedita Saboo! Lovetobag emphasizes fusion accessories with fine detailing. Each product is intricately handcrafted by Indian artisans. Fine hand embroidery and aged treatments add a sense of grandeur and romance to the products. The products have a flavor of India with an international appeal. Born in the timeless city, Tilfi brings to you the rich artistic traditions of Varanasi with a promise of impeccable quality and lasting value. Indulge in unique, classic and contemporary jewellery designs. Be treated as family and not customers at this exquisite jeweller. Go unconventional and elegant—start a trend with Samra Jewels. Explore a new majestic library for royal ensembles with signature styles by Ruceru in order to make your wedding day the perfect start for you married life. Internationally acclaimed, Radisson Blu is a chain of hotels across the world. It’s the perfect place to hold your wedding at! The collections by Esha Sethi Thirani are synonymous of effortless luxury which is presented through the marriage of contemporary silhouettes with hints of traditional embroidery. This is just a teaser of how star studded the Wedding Junction is going to be. Other brands include Creyate, Jewels of Jaipur, Disha Mucchala, Purvi Doshi, Riddhi Majithia and many more! All the brides and bride grooms to be, don’t give this grand wedding exhibition a miss! You can come meet us to sort out any query related to wedding planning. We are looking forward to meet you! Date & time: 20-21st January from 11am to 8pm.